Get ready for a party on Wall Street if President Trump and Congress successfully rewrite the corporate tax code. Corporate America's bottom line would grow dramatically under the proposed slashing of the corporate tax rate from 35% from 20%. Many critical questions about the GOP's tax framework remain unanswered -- including how to pay for it without blowing up deficits and whether it'll ever become a reality. Wall Street is drooling over the part of the GOP plan that calls for repatriating cash that is being kept offshore. American companies have hoarded about $1.3 trillion of cash overseas, where it's not subject to U.S. taxes, according to Moody's. The top 5 U.S. cash hoarders -- Apple (AAPL), Microsoft (MSFT), Alphabet (GOOGL), Cisco and Oracle (ORCL) -- hold 88% of their money overseas. It's not just Silicon Valley though. Other cash-rich companies include Johnson & Johnson (JNJ), Amgen, Gilead Sciences, Ford (F), Merck and Pfizer (PFE). Each of them were sitting on at least $25 billion in cash at the end of last year, according to Moody's. 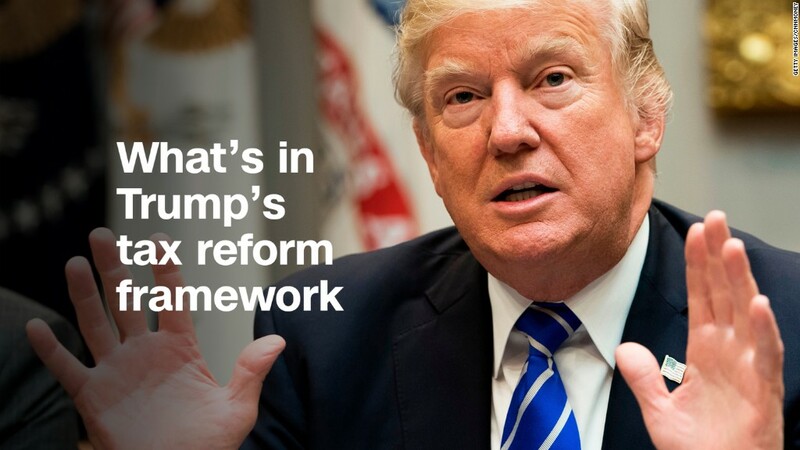 The tax plan seeks to encourage U.S. multinationals to bring those profits back to the U.S. by offering a one-time, low tax rate under "deemed" repatriation, meaning they have to pay the tax whether they bring the money back or not. The goal is to get companies to deploy that cash to create jobs by building new factories and investing in the business. In reality, much of that money will likely go to investors in the form of dividends and share buybacks. Banks have a higher tax burden, making them big winners if rates go lower. Financials account for 25% of the tax expenses of the broad S&P 1500, according to KBW Research. JPMorgan Chase (JPM), Wells Fargo (WFC) and Bank of America (BAC) would all enjoy a 20% or more jump in profits if the corporate tax rate is lowered to 20%, KBW estimates. Banks also stand to gain in other ways, too. The repatriation of hundreds of billions of dollars in cash could find a home in banks. All of that cash may lead to an uptick in M&A deals that Wall Street firms get paid to advise on. A faster economy, which is the goal of the tax plan, could boost demand for loans. More good news for banks: Tax reform may cause interest rates to rise. Higher rates make it easier for banks to profit on the difference between what they charge borrowers and what they pay on interest. "Banks touch all the bases," said Art Hogan, chief market strategist at Wunderlich Securities. Companies that tend to pay more to Uncle Sam each year will obviously benefit more than those who pay very little. The sectors of the S&P 500 that paid the highest tax rates last year were telecom (33.4%), consumer staples (29.1%) and consumer discretionary (28.5%), according to Howard Silverblatt of S&P Dow Jones Indices. Ninety-nine companies in the S&P 500 paid more than 35% in taxes last year, Silverblatt said. By contrast, he said that 115 companies paid less than 15%, including 42 that got money back. Small-cap stocks are on fire right now thanks to all the Trump tax cut talk. The Russell 2000, home to mostly smaller and U.S.-based companies, has hit a record five days in a row. The index has almost quadrupled the September gains of the more international-focused S&P 500. The reasoning is that smaller companies tend to pay more in taxes than their larger cousins, which tend to have more sophisticated tax strategies. Due to their size, even just subtle improvements to the cash flows of smaller companies can have a big impact. Trump's tax plan may also create some losers, depending on how the details on deductions shake out. For instance, some fear the GOP's plan to eliminate state and local tax deductions could hurt the real estate market in high-tax states like New Jersey and Illinois. That would be bad news for homebuilder stocks. Private-equity firms could also end up losing. The framework did not call for eliminating the carried interest deduction that benefits private-equity firms and hedge funds. However, Gary Cohn, Trump's top economic official, told CNBC that the president "remains committed" to ending this loophole. Of course, more negotiations are needed on the tax plan. The deal may ultimately collapse in a cloud of Republican infighting, like the Obamacare repeal plan did. But Hogan is betting it gets done, eventually. "Tax reform seems a lot more possible than any other pillar of the administration's platform. They desperately want a victory," he said.